You may have just passed your driving test and received your full UK driving licence or exchanged your foreign licence for a GB Licence and wondered what the various codes and categories on your licence mean. Displayed below is the front and rear view of a full United Kingdom driving licence along with each section explained.The paper counterpart of a UK licence is also explained. The paper counterpart of a UK driving licence is no longer issued by the D V L A as all information is kept digital. The licence paper counterpart no longer has any legal status. 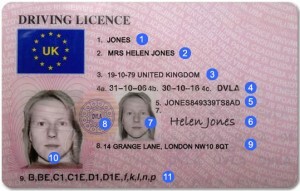 Although the images below represent a genuine UK driving licence, the information contained on the licence is purely fictional and will not correspond with any DVLA data. Front Of The Photo card Driving Licence Explained! Your licence personal details (1, 2 and 3): Fields 1, 2 and 3 of your photocard driving licence display your surname, first names, date and place of birth. Date of driving licence issue, photo expiry, issuing authority (4): The date displayed in 4a is the date the photocard licence was issued. 4b displays the date the photocard must be renewed and 4cdisplays the authority that issued the licence (DVLA). Driver number (5): Driving licence number format explained. JONES – Displaying first five letters of your surname. If surname is less than five characters in length, the remaining spaces will comprise of the digit 9. 849339 – First and last numbers are the year of birth. Second and third numbers are month of birth. (Note: in the case of female driving licence holders, ‘5’ is added to the second digit, this means that the second digit will be 5 or 6). The fourth and fifth digits are the day of the month of your birth. TS – The first two initials of your forenames. If you have only one initial then the second character will be a ‘9’. 8AD – Computer check digits. Licence holder’s signature (6): This is digitally reproduced and burned into the photocard from the signature you provided on the application form. Ghost photograph (7): This ghosted image of the licence holder’s photograph is a security feature. Issuing authority roundel (8): This shows the stamp of the EC authority that issued the driving licence. Holder’s address (9): This shows the licence holder’s permanent address in Great Britain. Holder’s photograph (10): This is digitally reproduced from the photograph provided by the licence applicant. Entitlement categories (11): The letters in capitals show the categories of entitlement covered by the European Community Directive. National categories are shown in smaller letters. Back Of The Photocard Driving Licence Explained! Production barcode (12): Used to link a photocard licence with its counterpart licence ready for dispatch. easily explain the types of vehicles in those categories shown. A GB provisional driving licence contains the same information as a full licence. 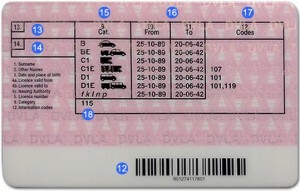 The letter ‘L’ displayed on the provisional driving licence has been placed by the DVLA since September 1999 on all GB provisional licences and confirms the holder is a learner driver. How Long Does It Take For My Driving Licence To Arrive! You will usually receive your driving licence within three weeks. If you have passed a practical driving test and handed over your provisional driving licence to the examiner, the test pass certificate the driving examiner issues you with entitles you to legally drive until your full driving licence arrives. How Long Does A Driving Licence Last! Your photocard driving licence must be renewed every 10 years. Section 4 on the front of your photocard licence provides the date your licence was issued (4a) and the date it expires (4b). Providing the address details held with the DVLA are current, they will send you an application form around two months before your licence expires. Which Countries Can I Drive With Uk Licence! If you live in the European Union or one of the European Economic Area (EEA) countries and intend on exchanging your current driving licence for a GB licence, listed below are the various country codes that will appear on your GB driving licence depending on the location of the licence you exchange. A1 Light motorcycles of no more than 125cc and of a power output of no more than 11kW (14.6bhp). A Motorcycles, with or without a sidecar. B1 Motor tricycles or quad bikes weighing up to 550kg (with no passenger). B Motor cars or light vans with up to eight passenger seats and weighing up to 3500kg. A light trailer can be attached. C1 Vehicles weighing between 3500kg and 7500kg. A trailer weighing up to 750kg can be attached. C Vehicles weighing over 3500kg. A trailer weighing up to 750kg can be attached. D1 Small passenger-carrying vehicles with nine to 16 passenger seats. A trailer weighing up to 750kg can be attached. D Any bus with more than eight passenger seats. A trailer weighing up to 750kg can be attached. B+E Motor cars or light vans with up to eight passenger seats, weighing up to 3500kg and pulling a heavy trailer. C+E Vehicles weighing over 3500kg pulling a trailer weighing over 750kg. D+E Any bus with more than eight passenger seats pulling a trailer weighing over 750kg.